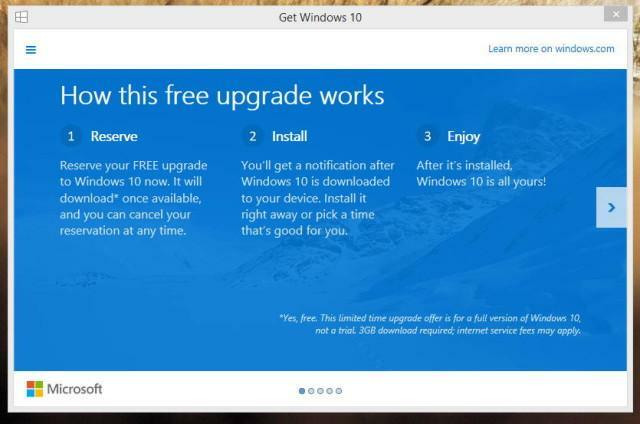 Microsoft starts prompting Windows 7 and 8 users to reserve their Windows 10 upgrade. 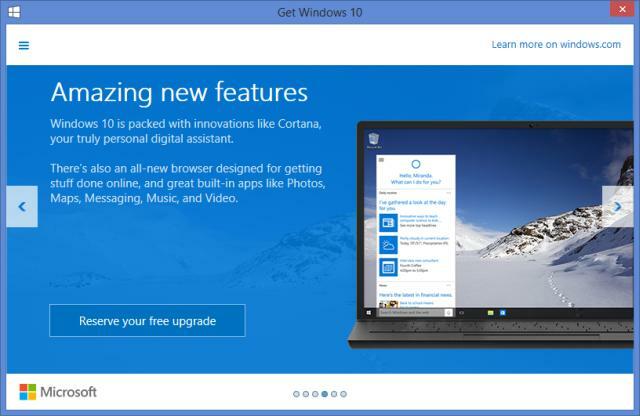 Many users have started getting the “Get Windows 10″ prompt on their devices. Redditt user p4block reported the message for his Windows 8 computer and after that other users have also confirmed receiving the message for their Windows 7 and Windows 8 devices as well. Windows 10 brings back the Start Menu from Windows 7. Microsoft has preloaded Windows 10 OS with Voice assistance Cortana Integration, a new browser- Microsoft Edge and Windows Defender anti malware protection. Apart from this Windows 10 also brings new photos, music, maps, mail, calendar and more apps to users. Microsoft states in a press release," From the return of the Start Menu to the variety of innovative features, Microsoft created a more personal, fun and productive Windows experience".